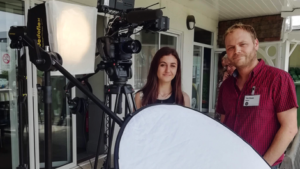 Earlier this year Digitom was invited to join the University of Kent’s co-curricular rewards programme, offering a two-week work experience placement to the successful student. The Employability Points Scheme offers undergraduates the opportunity to earn points and apply for one of 800 rewards. Our Founder & Creative Director was impressed by the high standard of applicants and decided to offer two placements. Here’s their diaries. It was my intention to get as much experience in the different stages and facets of video production as possible, from development to post-production, so I thought this placement would be of benefit to me by giving me experience within an actual work environment. The first day consisted of orientation and meeting the Digitom team. I later joined Tom for a meeting with a potential client regarding plans for a series of client testimonial films. I got to witness how Tom listens to his client’s vision for the content, and how he works with clients to develop their vision exploring various approaches to creating the video and how to market it online. 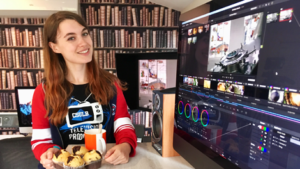 Daisy shadowing in the edit suite, with the essential muffins & coffee. In preparation for a shoot with Shepherd Neame I was trained by Tom in how to set up the camera, tripod, lighting, etc so I could be helpful on location. We travelled to the brewery in Faversham and filmed a piece to camera with the Chief Executive and voiceover for a new Visitor Centre video being produced by Digitom. I was able to shadow the edit, seeing how Tom ‘cherry picks’ the best parts of the audio and video, combined with motion graphics from Neil, crafting the story as per the storyboard. It was interesting to see how someone with years of industry experience collaborates with colleagues to deliver their best possible work. I was set the research exercise of looking at how brands and agencies use video content to connect with their respective demographics, and compiling that into an 800-word paper. Tom encouraged me to actively seek out how creatives in the industry are inspired, and inspire by others. 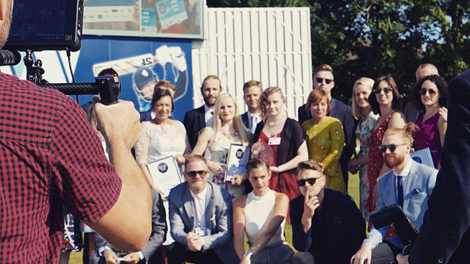 Looking at projects on The Drum, Creativepool, D&AD and the Content Marketing Association I learnt that it’s up to the creatives in the advertising and video production industries to deliver client’s messages in an entertaining and engaging format. Throughout this work experience, aspects I’d been taught in my film studies course were reinforced but I also learned about the practical aspects of video production which raise the quality of a video from amateur to a professional standard. I am grateful for the things I learned during my time, and would like to thank the Digitom team for giving me this opportunity to gain valuable experience within the company. Shadowing in the production office I sat across an edit being produced for a global medical company. The team had been working on re-versioning an American animation into three foreign languages for use across Europe, the Middle East and Asia. The written graphics (kinetic typography) needed to be translated from its original American form into UK English, Italian, German and French, each with a subtitled version to accompany it. Tom was editing the relevant voiceover artists to each animation, mixing in the music and adding the subtitles. I attended a meeting with Maxim to plan filming of an event film for the annual Kent Press & Broadcast Awards. 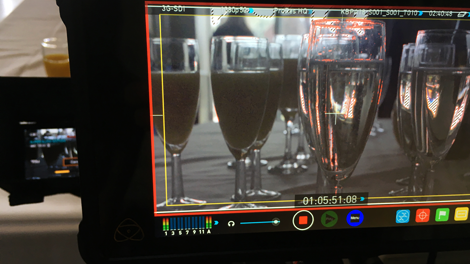 This allowed me the chance to partake in a Digitom production from start to end, sitting down with a client and working out the filming schedule so we captured all the aspects of the ceremony and a detailed call sheet. I was shown how to setup the Sony FS5 camera, filming in 4K along with the lights and also the gimbal – which allows the operator to film smooth tracking shots. I attended the event and assisted with the filming, helping to mic up contributors, and take behind the scenes photos. I also enjoyed the ceremony, with a lovely lunch and free goody bag. The following week we edited the film using Blackmagic Design’s DaVinci Resolve software, which was interesting to work on as I had not previously used the software. However I was able to assist editing the rushes and learning how to use the graphic templates to produce name straps for contributors and sponsors. I also shadowed a number of meetings with potential clients who were interested in the training Digitom offers to in-house media marketing development. This was particularly interesting because it gave me an insight into the business-side of the industry, which I had not experienced in a University based environment. I have loved getting real-life experience of a business environment.